There are many benefits of exercise during pregnancy, as you’ll read below. But one of the best things is that it gives you a little ‘you’ time. Read on to get some tips on starting out and to find out the safest way to exercise with gestational diabetes. It’s really important to include some daily exercise during pregnancy as well as eating low-GI food and taking any prescribed diabetes medicines. Exercise improves insulin sensitivity and helps keep your blood glucose levels (BGLs) stable. It also provides general health benefits including better sleep, improved fitness for birth and nursing, improved mood and faster return to fitness. If you haven’t been physically active before pregnancy, then aiming to become incredibly fit during pregnancy is unrealistic. Your physical activity should help you become fitter than if you hadn’t exercised in pregnancy and will keep your BGLs more stable in the process. Continuity of practice is the best way to help you keep up the good work and creating time to exercise a little each day from the beginning of your pregnancy helps makes it part of your daily routine. You find you get into the habit and you won’t be scrambling to fit it in at 6 months when you realise you forgot to start! If you’re using insulin to manage your BGLs remember that you are at more risk of a hypoglycaemic event or ‘hypo’. This is where your BGLs fall too low, say below 4 mmol, and you start to feel unwell – dizzy, confused, sweaty and fatigued. Check with your endocrinologist about the chances of a hypo if you are on glucose-lowering medication. Unfortunately these signs and symptoms are similar to those of exercise so this can make it hard to realise you are having a hypo. Avoid exercising in the peak insulin action – this is when the dose of insulin is working at its best and is its strongest. Exercise is an insulin sensitiser, so can boost the impact of your insulin dose. Please check with your AEP (Accredited Exercise Physiologist) or CDE (Credentialled Diabetes Educator) if you have any questions about this. Avoid injecting in the muscles you are exercising. Check your BGLs 30 minutes before exercise. If it’s near 5 mmol you may need to eat a little carbohydrate to avoid a hypo post-exercise. 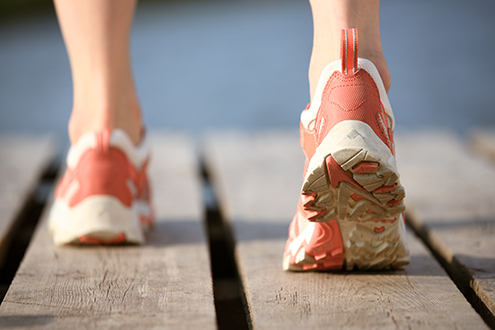 Check your BGLs after exercise and again if you feel unwell during exercise. If you are commencing a new exercise program tell the instructor or do it with a friend who can keep an eye on you. Start exercising as soon as you can in the early stages of pregnancy. This makes it easier for exercise to become part of your daily routine. Think of exercise as something that will evolve during pregnancy. First trimester fatigue might only allow you to incorporate a short walk or two in each day (to the bus stop or the shops). It’s common to regain your energy in the second trimester so make the most of it with swimming, pilates, yoga or a slightly more intense walk. During the last trimester you’ll be feeling bigger and heavier. All the above options are still great but you might need to adjust the intensity and be sure to rehydrate regularly. Exercise with a friend where possible. It can help to get you out of bed in the morning or out of the house when you know someone is waiting for you. Pay for it. Knowing you’ll lose your money if you don’t go can be the motivation you need to work out. Keep a set of exercise clothes or a pair of sports shoes in the car or at work so you exercise when the opportunity comes up. It’s common to experience hip and lower back pain during pregnancy and this often increases as the baby gets heavier. Doing 5 minutes of simple stretches each morning and evening to keep your body supple will make a difference. Exercise 1 – Sit on the edge of a chair with one foot flat on floor. The other leg is crossed with your foot on opposite knee. With a straight back, gradually lean forward and open up the hip joints. Do this for 10 seconds each side, alternating 4 times. Exercise 2 – Sit on the edge of a chair, feet flat on the ground, arms by your sides and hands holding onto the sides of the chair. Keeping your back straight, take one foot, toe pointed, and slide it backwards under the chair as far back as you can go while keeping your back straight. Then roll your heel backwards over your toes feeling a stretch in your hip flexors. Hold for 25-45 seconds and repeat twice each side. You can either to this lying down or seated. Simply tilt your pelvis by gently arching your back and then do the opposite and flatten your back into the ground, bed or chair back. Every pregnancy is different, even for the same woman. Some pregnancies involve extreme fatigue, others extreme nausea, insomnia, back and/or pelvis pain, heartburn, reflux and many other symptoms. The exercise you choose can be determined by some of those factors. This is a great cardiovascular workout for maintaining muscle strength without impact loading on joints. However if you experience any pelvic pain or have been told you have pubic symphysis this may not be comfortable for you – especially breaststroke. Speak to a doctor, physiotherapist, osteopath or other health professional for more advice. These days there are many pregnancy specific exercise classes with staff who know what is and isn’t safe for pregnant women. These classes are wonderful if you haven’t exercised much lately and need some extra motivation. They are often called ‘antenatal’ classes. Antenatal pilates, yoga or aquatic exercise is a good place to start but if you can’t find antenatal classes in your neighbourhood, then make sure your instructor knows you’re pregnant and adjusts the exercise you perform. The benefit of walking is that it’s free, you can do it when you want and you can adjust the intensity and speed depending on how you feel that day. Make sure you wear a good pair of supportive shoes, eat some carbohydrates before starting and take some water with you. A stationary bike is best especially in the later stages of pregnancy when your balance changes. Be careful with continued pressure on your pelvis as this can create pelvic girdle pain. Even if it’s simply lifting yourself out of a chair, resistance training maintains muscle mass, protects joints and can be modified for any stage of pregnancy. Remember you’ll be lifting, holding and carrying that lovely little baby for so much of your day, it’s best to get strong now. Some things you can do at home include pushing up from sitting on a sturdy dining room chair or doing squats if you’re able to. A single arm row with a resistance cord or dumbbell is great for your shoulders, upper back and general posture. Or consider a gym. This might be a chance to check out their baby minding facilities for when your baby arrives. Expect your exercise capacity to change over the course of your pregnancy, so do what feels moderate on that day and be prepared to adjust. If you start with an exercise routine that doesn’t end up working for you, don’t be put off. Find something else that works with your schedule and physical ability, but don’t give up! Remember you’re exercising to get your BGLs under control and to feel good about yourself, not to make you super fit. Always listen to your body, it will tell you if you’re overdoing it. Please note that the information in this article is intended for your consideration only. If you are experiencing pain or feel unwell after exercise, contact your health professional to establish a fitness program that works best with your medical situation and fitness level.